According to Consumer Reports and review websites, the best elliptical exercise machine is found in the price range of $1000 to $4000. Forget about elliptical trainers such as the cheap Orbitrek Trainer which is often advertised on late night TV. Consumers have been complaining about these machines literally shaking themselves apart within a year and the manufacturer does not seem to be too accommodating when it comes to honoring the warranty. One of the best rated elliptical exercise machines in 2005 is the Precor EFX 5.17 cross trainer with a suggested retail price of $2,799. The machine provides a better lower-body workout than a stair climber, stationary bike or treadmill. Four different workout programs and 20 resistance levels keep motivation in continuing your exercise routines high. The Precor EFX 5.17's console features large LEDs and accompanying graphics, allowing you to better monitor your progress while exercising on this elliptical cross trainer. The electronic readout monitors calories burned and strides taken. 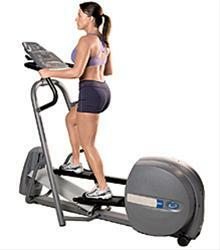 The elliptical machine's incline and resistance level can be adjusted with the touch of a button. Keeping track of the intensity of the exercises and staying with one's heart rate target zone is accomplished with the elliptical trainer's SmartRate instant display with optional Heart Rate Chest Strap. 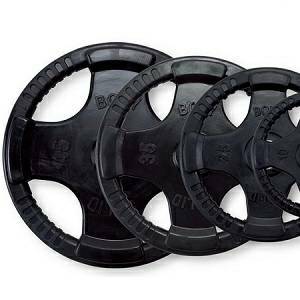 But one of the best features of this top elliptical trainer is the machine's patented CrossRamp technology, making it a 100% elliptical Cross Trainer. The machine's adjustable ramp can be inclined from 12 to 25 degrees to work the glutes, quads, hamstrings and calves for a total lower body workout. Precor has always been an industry leader when it comes to innovative designs. The Precor EFX17 has received some of the best elliptical trainer reviews and ratings in 2005. According to Prevention magazine, this elliptical machine is one of the most durable on the market and is highly recommended if you are into serious exercising and appreciate the features, versatility and peace of mind that comes with buying the very best. The Precor EFX 5.17 Elliptical is among the more space saving and economical designs among precor home ellipticals. Excellent stability, a smooth, quiet motion, portability, and low maintenance have made the home model Precor elliptical an excellent choice for a residential environment.